Seattle's Holy Mountain and other beer makers are incorporating wine into their recipes. “It takes a lot of beer to make great wine.” Or so the old winemaking chestnut goes. These days, the inverse is becoming true, with wine making inroads into beer recipes themselves. 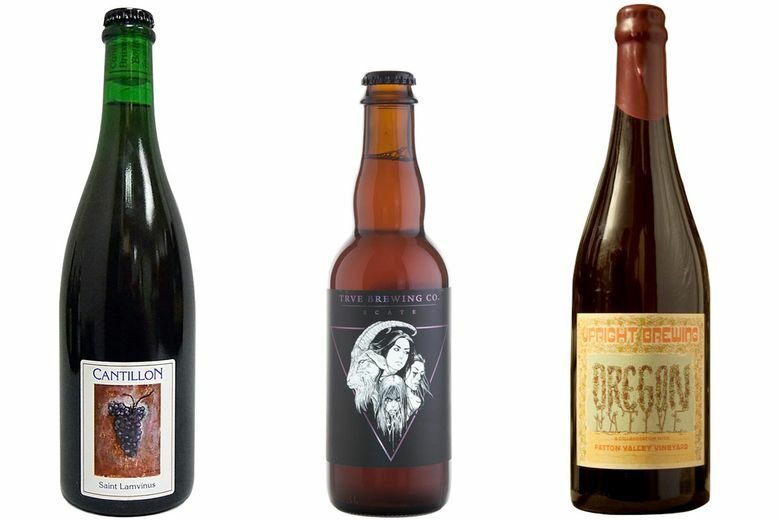 These beer-wine hybrids often start with a saison farmhouse or sour ale as a base recipe-something that already has a bit of heft to stand up to those grapes. Sometimes the beer is co-fermented with them at the outset; other times it’ll get racked onto the fruit for extended fermentation and aging. The results are wildly unique, sometimes odd and usually a delicious blurring of the lines. • Seattle’s Holy Mountain produces some of the most reliably worthwhile farmhouse brews in the country. With Sacrament, it’s begun a foray into aging beer in oak on wine grapes. The first batch is a wheat-based ale aged and fermented on Carménère grapes and skins from the Walla Walla Valley. The result has a fruity wine nose that’s balanced by a tart, tannic astringency once you start tasting. • A particularly successful Stillwater hybrid, Oude Bae is a sour amber ale aged on French oak with pinot noir grapes. Nicely tart and beautifully vinous, first sips reveal an appealing funk and richness atop a drinkable, tangy body. This one, out of Baltimore, now comes in cans, making it the perfect grab for your next picnic. • Brasserie Cantillon produces what’s likely the most sought-after traditional Belgian lambic out there, but its Saint Lamvinus has a cult following all its own. (Beer nerds often insist a great lambic’s aging ability is akin to that of fine wine, so infusion with grapes is only logical.) Here, a blend of lambics are barrel-aged for more than a year with merlot grapes. It pours a brilliant burgundy hue, yielding intense fruit on the nose and oak on the palate. • Here’s probably the most accessible beer-wine hybrid available right now: a new IPA brewed with riesling juice from Danish gypsy-brewing global power Mikkeller (soon opening its first New York brewpub at Citi Field-marking its 32nd location worldwide). This hoppy brew starts tropical-fruity and finishes with a sweet blast of grape. • Bucolic Texas farmhouse Jester King’s recent output has been particularly grape-heavy, with beers utilizing merlot, sangiovese, and syrah varietals among others. Bière de Blanc du Bois is an especially acclaimed example. This barrel-aged sour is refermented with Texas-grown blanc du bois grapes after maturation. White wine complexity meets a fruity and woody tart backdrop. • Rustic metal heads TRVE can always be counted on to churn out something worth tracking down, and Ecate is no exception. A golden sour aged on cabernet sauvignon pomace (the pulpy solid remnants of fruit after pressing for wine), this resourceful brew makes something beautiful out of what’s essentially a leftover. Citric, dry, and terrifically fizzy.